Back in November 2010 the silent film historian and restorer Kevin Brownlow was deservedly given an honorary Academy Award. He received his award at the Academy of Motion Picture Arts & Sciences’ annual Governors Awards ceremony alongside two other noteworthy film figures, Francies Ford Coppola and Eli Wallach (Jean-Luc Godard was also given an honorary Award, but naturally he declined to turn up). One imagines that the conversation between Brownlow and Coppola turned toward Napoléon, the epic 1927 film by Abel Gance which Brownlow had dedicated his life towards restoring, and which Coppola had presented in the USA back in 1981 in a re-edited restoration with a score by his father, Carmine Coppola. Perhaps while clutching their statuettes they decided that the time had come to end the block on any screening of the film in the States that did not feature the Coppola score, which for thirty years had prevented American film enthusiasts from seeing the film in form in which Brownlow had restored – and was continuing to restore, since the film had grown longer in the intervening years, had had its colour tinting and toning restored, and of course came with Carl Davis’ famous (and ever-expanding) score. It was time for Napoléon to return to America. The real Napoléon helped build America, of course. When he was planning to invade England in 1803, and in need of funds, he approached the American negotiators hoping to purchase New Orleans for $10M (this at a time when large parts of North America was still owned by the French) and instead offered them the whole of Louisiana for $15M. It was one of the biggest land bargains in history, and helped make the United States become what it is today. And Napoléon failed to invade England. Maybe Abel Gance would have got round to including the Louisiana Purchase as part of the six films he dreamed of making about Napoléon. He would certainly have been reluctant to leave out any detail of the Emperor’s life if it revealed the mark that he had made upon history. Gance’s astonishing, preposterous ambition was indeed to make six lengthy films documenting the life of the Emperor, a project he began in 1925. Of course he did not have the financing in place for six films, not even for one at first, but after his original financiers failed him Gance found from a Russian, Jacques Grinieff, sufficient to complete film number one, which took Napoléon from childhood, through the French revolution, to his invasion of Italy. The film, full title Napoléon Vu par Abel Gance, premiered at the Paris Opéra on 7 April 1927. It ran for three-and-a-half hours, with a score by Arthur Honegger; later a six-and-a-half-hour version was screened, though Gance’s original cut is said to have been nine hours. A film at such a length would always have struggled to find screenings, and the film was cut down into a variety of shorter, increasingly incomprehensible versions. Its commercial fate, and the arrival of sound, condemned Gance’s six-film dreams to dust (though his script for part six, Napoléon in exile on St Helena, was filmed in 1929 by Lupu Pick in Germany as Napoléon auf St Helena). Time moves on, and in 1955 a 76-year-old Abel Gance turned up at the British Film Institute in London. Happily the distinguished elderly filmmaker was recognised, but then Deputy Curator Liam O’Leary did an extraordinary thing. He called for a 17-year-old boy to meet M. Gance (his mother had to telephone him at school when he was in the middle of an exam), since he was known to be an enthusiast for the man’s work. 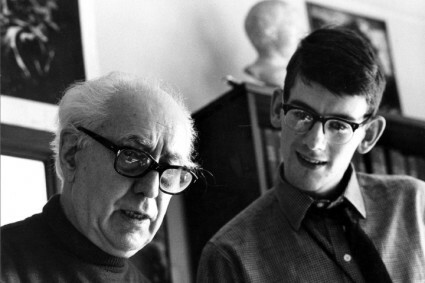 It’s hard to imagine such an occurence today, but back in 1955 that was how Kevin Brownlow first met Abel Gance, and it set in train a mission by the young man to restore Napoléon (which he’d first encountered on 9.5mm when aged 15) and with it the reputation of a by then forgotten master of the silent cinema. (The Ann Harding’s Treasures blog has an interview with Brownlow where he recalls the anecdote). The history of Napoléon’s restoration has been amply documented, not least by Kevin Brownlow himself in his book Napoleon. The restoration premiered in 1979 at the Telluride Film Festival, Colorado, with Gance in attendance (he died in 1981, aged 92). It was in 1980, with funding from Thames Television in the UK, that Napoléon made it full impact, when it was presented in London, at four hours and 50 minutes in length and with a score by Carl Davis. Its effect on audiences was cataclymsic (I was a little too young to be aware of all this, and only caught up with Napoléon on television a few years later). The film was a bravura advertisement for all that the camera could do. 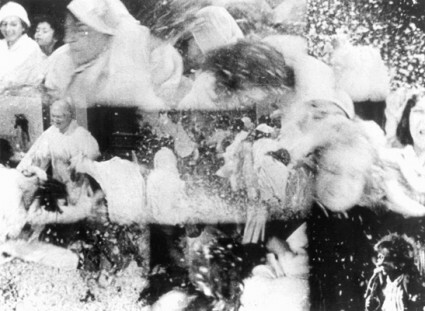 With its rapid editing, hand-held (and horse-back held) camera shots, super-impositions on a phantasmagoric scale, camera effects adopted from the avant garde, startling camera angles, above all its multiple screen effects (at one point – a pillow fight – the screen divides into nine separate, interelated images), culminating in the overpowering Polyvision triple-screen effect at the end of the film as Napoléon leads his army into Italy, it was one of the most powerful demonstrations of cinematic imagination that many in the audience had seen. It was as revolutionary in theme (it covers the French revolution, of course) as it was in technique, so that the two became as one. It did not only restore Napoléon and the reputation of Abel Gance; to a considerable extent it helped restore the silent film as an art form. We were all made to see what Kevin Brownlow had always believed. Time moves on again, and screenings of Napoléon have become increasingly rare, owing as much to the compleixites of rights issues as the expense of putting on a film, at such a length, with full orchestra, and requiring an 85-foot-wide screen for the climax. 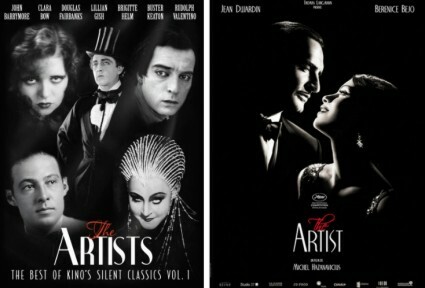 A generation or more of silent film fans has grown up without having seen Napoléon, save for a rather lame VHS and DVD version with the Carmine Coppola score which lessened Gance’s reputation rather than enhanced it. 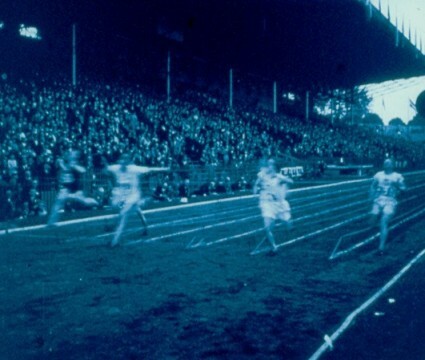 In 2000 Brownlow unveiled the film’s colour tinting and toning for the first time at a UK screening at the Royal Festival Hall. It was now a shade over five-and-a-half hours long. It was last screened in the UK in 2004. The reactions have begun with ecstatic, and then worked their way up from that. There are vivid reviews by Kenneth Turan in the Los Angeles Times and by Mick LaSalle for the San Francisco Chronicle. Manohla Dargis in the New York Times gives a good account of the film’s and the film restoration’s histories. The San Francisco Silent Film Festival, hosts for the screenings, provides a handy set of FAQs (from which we learn that there is not to be a DVD or Blu-Ray release – not until someone invents Polyvision TV screens, it would seem). 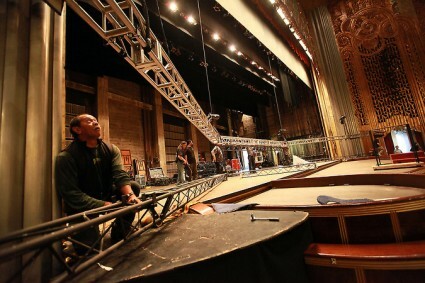 MercuryNews.com has a photo slideshow of preparations for the screening at the Paramount Theatre. The Mubi Notebook has helpfully collected together and summarised the main web celebrations of the film’s screenings. And Carl Davis has provided a diary of his experiences on his website. Napoléon is more than a restoration, indeed it is more of a re-creation, an attempt by Brownlow to build ever closer to that original conception of the film, to re-enter the mind of Abel Gance. There have been so many versions of the film (Gance tinkered with his film for years, much as Brownlow would then do), it would be hard to point to any one that would be definitive. Is the longest version the best? Of course not – at least, not necessarily so – but that doesn’t seem to be the point. It is the quest that matters, quite as much as whatever stage the film may have reached at its successive screenings. The auteur was once Abel Gance; now the auteur is Kevin Brownlow. It is rumoured that Napoléon may now be coming to the Royal Festival Hall in London in November 2013. Perhaps it will be longer still (a further restoration is rumoured). Perhaps some have started queuing already. It has been twelve years since I last saw the film, and I have to admit that at the time I was impressed, but not overwhelmed. I found the film to be a technical showcase with plenty of felicities but without much real insight, and with an indifferent central performance from Albért Dieudonné (the boy Napoléon is played by Vladimir Roudenko, who is much better). Style alone is not greatness, though it may be great to watch. I hope I get the chance to see the film once more and to find myself proven wrong. I hope everyone gets a chance to see it. On November 6th the Cornerhouse in Manchester will be presenting an unusual form of silent film accompaniment. “Human beatboxer and sound artist” Jason Singh will be accompanying a screening of John Grierson’s silent documentary film Drifters (1929) using his voice alone – with a fair bit of processing, sampling and pre-recorded vocal sounds. The result, to judge from the video clip, sounds like it could be really effective. Drifters is certainly an imaginative choice – and with its poetic, modernistic treatment of an activity (herring fisheries) steeped in tradition, it could be an astute one. How often have silent films been accompanied by the human voice? Not too often, I think. I’m just back from a weekend at Athy in Ireland, where the annual Shackleton Autumn School (a gathering of polar exploration enthusiasts in the town of the great Antarctic explorer’s birth) is held. I introduced a screening of the BFI’s restoration of The Great White Silence (1924), which documents Shackleton’s great rival Captain Scott’s failed attempt to be the first to reach the South Pole. The restoration has gained great acclaim, not least in these pages, but I was none too complimentary about the music/soundscape by Simon Fisher Turner, which I thought used the film as decoration to an experiment in sound textures rather than being a proper accompaniment. Well, seeing the film again, I was wrong. The version of the score on DVD (lacking the strings that featured at the live premiere) is often spookily effective electronica, which brings out the film’s otherworldly qualities. The electronic sounds do lack variety after a while, but Turner spices things up with jolting introductions of contemporary gramophone recordings, and most powerfully a solo voice singing ‘Abide with Me’ over the still images and model shots recording the Scott party’s fatal return from the Pole. The unaccompanied voice had a powerful effect on the audience; a real coup de théâtre. I have seen or heard silents accompanied by most things – piano, organ, acoustic guitar, electric guitar, orchestra, brass band, harp, electronica, percussion, rock band, violin, accordion, jazz band, recorders, player piano, turntables, silence – but only this once with the human voice alone. However, in the comments to a recent Bioscope post on those times in the silent era when silent film were shown without music, Maria Velez records the existence of a vocal quartet at the La Scala cinema in Glasgow during the first months of the First World War, which seems not only to have sung between films but during them as well. Was this unique, or does anyone know of any other such examples from the period – or from the presentation of silents today? 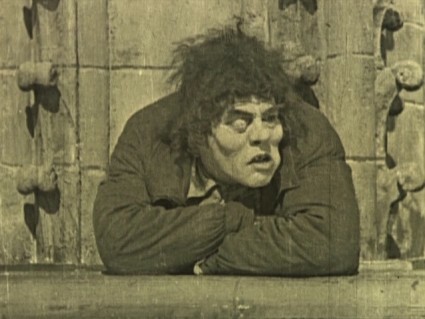 There were plenty of examples from the silent era of the use of voices behind or to the side of the screen, for singers (recorded or live) accompanying song films, of which there were a huge number in the pre-WWI period; and there were reciters of dramatic works, such as Eric Williams undertook in some British venues in the 1910s. And I’ve seen songs introduced as part of silent film screenings, such as the memorable performance of the ‘Internationale’ during Mutter Krausens Fahrt ins Glück at Pordenone last year. 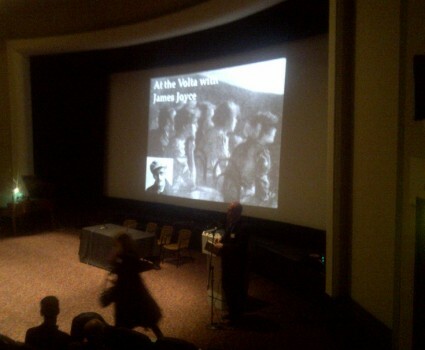 Pianist Donald Sosin‘s silent film accompaniments have included songs sung by his wife Joanna Seaton. But voices or voice used as musical accompaniment in a non-song context? Anyone? Or any examples of unusual forms of musical accompaniment to silents beyond those that I’ve listed? There’s a news piece on Jason Singh and Drifters at Wired, and further information on the Cornerhouse website. Silent films going on tour with live orchestral accompaniment is not something that happens too often. So it is particularly pleasing to be able to report the forthcoming tour of The Battle of the Somme (1916), the iconic First World War documentary filmed by J.B. MacDowell and Geoffrey Malins, with orchestral score by Laura Rossi. 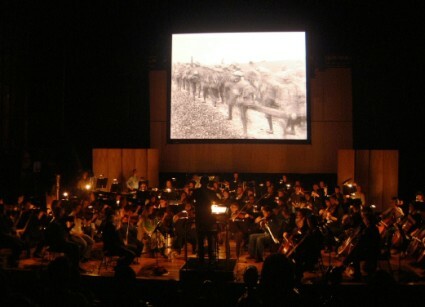 Rossi’s exceptional music (the first scored for a British feature-length silent since the silent era itself) was first heard at the Queen Elizabeth’s Hall in London in 2006, and can now be found on the Imperial War Museum’s DVD release (the background to film and DVD can be explored further on this Bioscope post). The music has been scored for (to quote from Rossi’s site) 2 Flute (2nd doubling Piccolo), 2 Oboe, 2 Clarinet in Bb, 2 Bassoon (2nd doubling Contra Bassoon), 4 Horns in F, 3 Trumpets in Bb, 3 Trombone, 1 Tuba, 1 Timpani/Percussion, 2 Percussion, Harp, Piano, Strings. You can listen to sound clips, view video clips, see a sample page from the score, purchase/download the CD or purchase the DVD, and more, all from this link on Rossi’s site. The Battle of the Somme remains one of the most successful British films ever made. It is estimated over 20 million tickets were sold in Great Britain in the first two months of release, and the film was distributed world-wide to demonstrate to allies and neutrals Britain’s commitment to the First World War … The Battle of the Somme gave its 1916 audience an unprecedented insight into the realities of trench warfare, controversially including the depiction of dead and wounded soldiers. It shows scenes of the build-up to the infantry offensive including the massive preliminary bombardment, coverage of the first day of the battle (the bloodiest single day in Britain’s military history) and depictions of the small gains and massive costs of the attack. The Battle of the Somme captures the point of loss, the ghosts on the screen, the living pictures of the dead. Of course it is a deeply partial record. It shows no real fighting beyond shellfire, no serious injuries, no pain, little hatred (look for the shove that one British soldier gives to a captured German who stumbles past him). And of course it shows only the Allied point of view (the Germans would respond with their own film, Bei unseren Helden an der Somme, in 1917). But we recognise it for what it is able to show, not for what it leaves out. It is a profoundly memorably expression of the hopes and fears of its age. This is a bold venture indeed (particularly with four different orchestras) and hopefully further such screenings will follow, especially as we are getting that little bit closer to the war’s centenary. Rossi has more recently composed a score for the film’s follow-up feature, The Battle of the Ancre (1917), sound clips for which can also be found on her site, as well as her earlier work composing for the British Film Institute’s acclaimed Silent Shakespeare DVD. 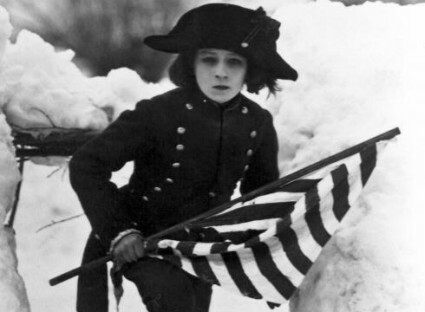 The composer Carl Davis has announced on his website that the full restoration of Abel Gance’s Napoléon (1927), with his symphonic score, will receive its US premiere in March 2012. As Davis notes, “a 32 year odyssey has been achieved”, since there has been a battle between rival restorations and scores of the film, with a re-edited version with score by the late Carmine Coppola (father of Francis Ford Coppola) that was exhibited in the USA in 1981 effectively keeping out the full Kevin Brownlow restoration, with all of the material he has found since 1981 (now 332 minutes in total), and Carl Davis score. Without knowing any of the details, clearly peace has broken out (might Kevin and Francis had a chat about things when they each were awarded honorary Academy Awards last year?). There is a triumphalist trailer for the film on the TCM site which states that, courtesy of the San Francisco Silent Film Festival (and American Zoetrope, and The Film Preserve, and Photoplay Productions, and the BFI) the film will screen at the Paramount Theatre, Oakland, San Francisco, with the music played by the Oakland East Bay Symphony. There will be four performances only. We will add more information as and when we find it. One of the features I regularly get asked to include on the Bioscope is a list of silent film screenings. I’ve always said no because the subject is too broad (particularly given the Bioscope’s international scope) and I wouldn’t want to offer an inadequate and incomplete service. Instead I point people to Nitrateville’s Silent Screenings list or the Silents in the Court site (for US screenings), and keep information on screenings on the Bioscope to festivals and prestige events of more than local interest. However, that still leaves a gap, and I’m delighted to report that someone has stepped in to provide such a service for silent films in London. 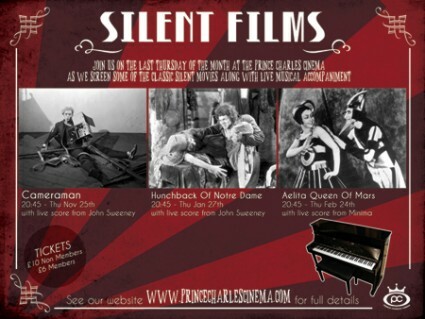 Silent London is a blog dedicated to silent film screenings in London. It’s only been running for a couple of months, and already it’s proving to be informative and thorough – indeed looking beyond London for its inspiration on occasion. There is also an active Twitter feed, @Silent_london. Though the site maintains anonymity, the person behind it is Guardian subeditor Pamela Hutchinson. She has the contacts, and she has the enthusiasm – Silent London is certainly a site to keep an eye on. 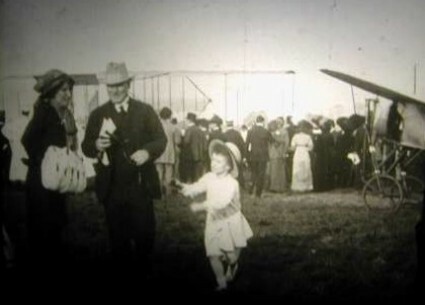 I’m back from my latest film adventure, which this time took me to Glasgow to present ‘At the Volta with James Joyce’, a programme of films programmed by Joyce at the Volta cinema in Dublin at the end of 1909/early 1910. I’ve written on a number of occasions on this story (here, here, here, and here, not to mention here. Oh, and here too), so no need to add any more, except to say that this was presented as part of the December 1910 Centenary Conference – the centenary being that of modernism (which Viriginia Woolf decided began 100 years ago – specifically she prononouned that “on or about December 1910 human character changed”). So it was full of modernists, who are full of brains and hifalutin jargon yet great people to go out for a drink afterwards. But what made the event memorable for me is what went on behind the scenes. Owing to the snow that has hit the UK over the past week or so (though thankfully there was a thaw in Glasgow when I was there) there has been a big delay in deliveries of all kinds and – to keep the story simple – we discovered on the afternoon before the show that the films were sitting in a vault awaiting collection by DHL who were still dealing with a 7-day backlog. Much panic and frantic phone calls ensued. I thought briefly of carrying the films with me on the plane (not really practical, and likely to cause comment in airport security). However we found some of the Volta films on a DigiBeta tape which was copied onto DVD, though most of them had German intertitles and we had no translation. But a second DVD that had been lent to the pianist (the excellent Forrester Pyke) had further films with English titles, albeit with timecode at the top of the image. With five films on one DVD arrriving by car from Stirling and me flying up to Glasgow with three films on a second DVD (with a Google Translate approximation into English for the longest German-intertitled film, which I then read out while it was screened), and with two hours to spare, we had a show. It’s always hazardous programming films, especially early films, where the more things you have to show the more things there are to go wrong. You can get the wrong film sent to you, you can be sent the right film can but find a different film inside, you can get a different film with the same title as the one you want to show (two films from the 1900s called Cheese Mites and two from the 1940s called Dressed to Kill at the BFI have always caused confusion). You can get films with a reel missing. On one occasion, which has passed into legend, the BFI’s print of A Night to Remember was sent for a screening at MOMA as part of a major British cinema retrospective, only for MOMA to discover that the last reel wasn’t there. Undaunted, BFI staff on hand went on stage and acted out the final reel – to what degree I’m not sure, since the final reel does feature the sinking of the Titanic, of course. I had a similar experience myself at a conference in Bristol, when I was talking about the first ever Shakespeare film, King John (1899), which had recently been re-discovered. Owing to a series of errors, which I fear were my fault, the film hadn’t turned up. So I put up a still image, got up in front of the audience, and acted out the entire film. This wasn’t quite as much of a challenge as it might seem, since the film is just minute long and chiefly features King John in his death agonies, and though I’m no actor I can do death agonies. Anyway, it brought the house down. On another occasion, at the Museum of the Moving Image in London, we were putting on a show of Chaplin rarities, and had announced beforehand that we would be showing the super-rare The Life Story of Charles Chaplin (1926), a British-made semi-documentary, semi-biography which Chaplin’s lawyers got banned. Unfortunately at the last minute the rights-owner refused us permission to screen the film, which was ironic. So all we could do was hold the tape copy that we had before the audience and say that, we promised to show it to you and here it is. They were remarkably good about it in the circumstances. Anyway, the show must always go on, and my thanks go to everyone behind the scenes in Glasgow and London who turned what looked like being a disaster into a particularly successful screening. You just never know how things are going to turn out. Update: I neglected when writing this post to say something about the conference itself. I only heard a few papers, and overall the conference was covering modernism across all the arts and culture. Nevertheless there were a number of papers that addressed film or film-related subjects. I heard Katy Mullin speak about H.G. Wells’ 1909 novel Ann Veronica, comparing his propulsive heroine to the heroines of screen railroad dramas. John McCourt spoke on ‘Joyce, Ulysses and the Corruptions of Cinema’ with remarkable extracts from the unpublished diaries of Stanislaus Joyce (James’ brother) on filmgoing in Trieste in 1909-10 (including seeing pornographic films akin to those made by Saturn Films of Austria, samples of which can be found on the Europa Film Treasures site). It’s a huge shame permission has not been granted to publish the diaries. Cleo Hanaway spoke on ‘Joyce’s Ulysses and Early Films as Phenomenological Texts’ which was tough stuff to take in after a late night but made me want to read Maurice Merleau-Ponty and to consider whether we now (or then) view films as subjects or objects. I would also like to have heard Keith Williams speak on Wells, Joyce and Object Animation (looking at literary parallels between literature and trick films); Rosalind Leveridge on the ‘kaleidoscopic change’ for cinema in 1910; Anthony Paraskeva on Joyce and the actress Eleonora Duse (the Italian stage great who made just the one film, Cenere); and Maria Antonia Velez Serna, who is doing excellent work on early cinema and Scotland, looking at exhibition and distribution patterns. There is so much interesting work going on in our field outside the confines of film studies – and the more it goes on outside those confines, the better.